SINGAPORE – A full-strength Arsenal added another piece of silverware to their recent FA Cup success by beating Everton 3-1 in the final of the Premier League’s Asia Trophy on Saturday. Theo Walcott, Santi Cazorla and Mesut Ozil scored the goals in a strong display that left manager Arsene Wenger pleasantly surprised by his team’s free-flowing, attacking play. “I’m pleased with the performance. For long periods we played in a very convincing way and the way we want to play, together, good team play and everybody shared the same vision,” the Frenchman told reporters. Walcott struck the opener in the 22nd minute, lashing home after a neat lofted ball from the impressive Cazorla, who added a second in the 55th after some trademark quick feet and a low finish past Everton goalkeeper Joel Robles. 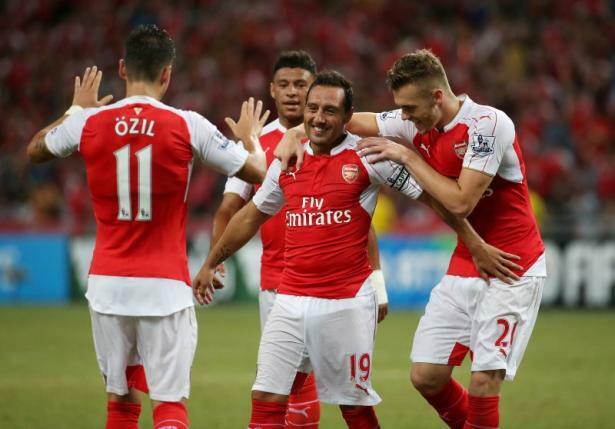 Arsenal, who beat a Singapore Select XI 4-0 on Wednesday with a youthful lineup, then turned the screws with Cazorla orchestrating a third for Ozil four minutes later as Everton wilted in the hot and humid conditions at Singapore’s National Stadium. Everton’s best spell came in the first half where they were unfortunate to be denied an equaliser four minutes before halftime when Arouna Kone’s shot deflected off Gareth Barry and into the Arsenal net but was ruled out for offside. New signing Cech produced a brilliant finger tip save from a Steven Naismith header before Kone smashed home the disallowed effort and also produced a strong save in the second period to deny Luke Garbutt’s long range drive. The tall Czech’s arrival after 11-trophy laden years at Chelsea has sparked hope among the club’s supporters of a first Premier League title since 2004 and his every touch was loudly cheered by the majority of the 52,107 in attendance. He looked set for a first clean sheet before Everton substitute Ross Barkley beat him with an emphatic 75th minute consolation. Manchester City were the last winners of the biennial Asia Trophy in Hong Kong and went on to win the Premier League the following season, a fact which brought a smile when pointed out to Wenger. “If it was as simple as that everybody would like to play the Asian Trophy every year,” he joked.